The Konmari journey is going slooooooooow. However, even if we have only done some of our clothes so far, I have certainly noticed a difference! 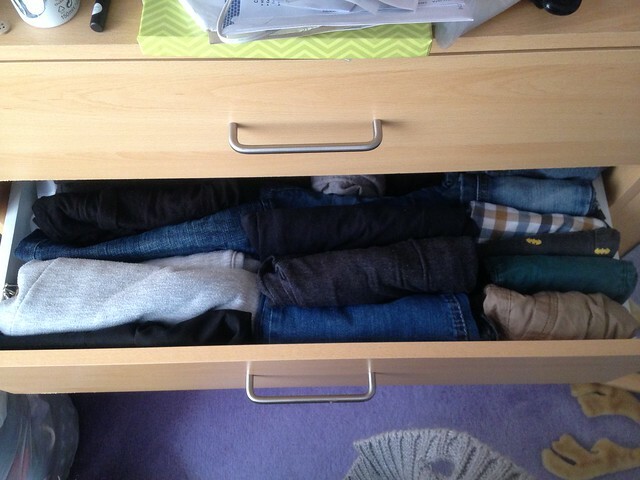 As you can see above, this is mine and Dylan’s “bottoms” drawer with trousers, shorts etc in. Dylan’s clothes no longer fit in the plastic craft tower thing, and there most certainly isn’t enough room for him to have his own wardrobe/drawers, so Dylan’s stuff is in with mine. He has a “row” down the right hand side of my drawers. Even Gareth has embraced it and sorted his clothes out too, and it is so much easier to find and get to those things. Granted I am still feeling ridiculously overwhelmed about all the other categories but knowing how much our clothes is better makes me super determined to declutter! I have new glasses, but since I got them Wednesday last week, I’ve not had much time to wear them. Dylan notices my glasses are different and is super grabby with them, and it’s always a pain in the tush to get used to new glasses anyway, so I probably haven’t been trying as much as I should do to make the time to wear them either. I’m on that. Dylan pretty much comes straight to bed with me, we don’t even try and force him to go in his cot at the moment, as he just screams and bangs his head against the side on purpose. It seems ALL of his back teeth are now coming through, poor little guy. The one morning when I had just a couple of hours sleep, I popped him straight into the travel cot with some toys so that I could lay down for an hour on the sofa, and in the hopes that when he had his daytime nap that I could catch a few Zzz’s on the sofa, but I struggle to nap during the day (delightful neighbours), but he came and had cuddles with me after that hour. He stood at the door at the weekend while I was at work and was saying: “Mumma. Mumma, come in.” Heart melting. He says Daddy, not sure why he says Mumma instead of mummy as I often refer to myself as, but it’s his thing now, and I’m trying to embrace that I’m not “mummy” but I am “mumma” lol. He’s grasping things, like when we were going to bed one night Gareth was home late so it was just the two of us, I pointed to the cot and asked “Cot?” and then pointed to the bed and said “Bed with mummy?” He pointed straight to the bed. Trying to put his shoes on himself.